Email marketing is the perfect method to engage and develop good relationships with your targeted audience. Using Lifeboat Marketing to outsource your email marketing campaigns enables you to concentrate on your business, knowing that your email campaigns are executed on time and to the highest standards. Industry leading email marketing at a sensible price. Experience top delivery rates from our authenticated UK servers. Helping you reach old and new customers Promoting your products and services by email can be a very powerful and flexible form of direct marketing, it’s one of the best customer relationship and customer acquisition tools available and allows you to communicate your messages quickly safely and accurately. Daunted? Then don’t be… Outsourcing your email marketing campaigns is a quick and effective solution if you don’t have the time knowledge or resource to manage campaigns in-house. Your campaigns will be created, tested and optimised according to best industry standards and executed on time. PDF reporting is provided to show full campaign statistics and includes confirmed delivery, timed opens, clicked, unsubscribed, soft and hard bounced. An excel spreadsheet is also included listing the status of every email address in separate worksheets. We can take care of every aspect of your company’s email marketing requirements, leaving you to work on the bigger picture – growing your business. Our expert team are waiting to help you send great campaigns out the door. Need to send out email campaign promotions, newsletters or event invitations but don’t have the time? Learn how Lifeboat Marketing can help save you time & money. 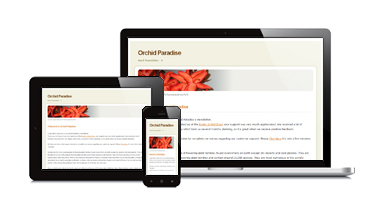 We create a new email template according to a brief supplied by you, alternatively we can use your existing template. Emails are tested against spam filters, display testing in all major email clients and optimised according to industry standards. Campaigns will be sent to all associates for approval and any changes will be applied accordingly. Once approved, your campaign can be scheduled at a time specified by you or the best time for your industry. Your contact lists are constantly updated via our automated one click unsubscribe and bounce handling features. Detailed analysis including a summary of active recipients and other interactions to help you improve for the future. While we manage your email campaign you can concentrate on runnning your business. Your email campaign will be created to engage and maximise responses, this includes HTML & plain text versions. Your campaign will be tested against our spam checker feature & major email clients before each send. 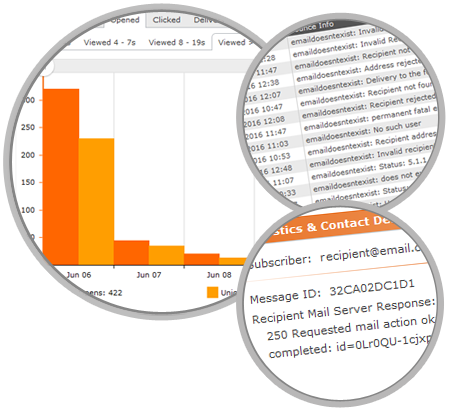 Each campaign is tracked and monitored for timed opens, clicks, forwards, soft & hard bounces plus automated unsubscribes. Generate leads directly from your website, we supply the coding for website integration and auto-subscription management. Improve your target audience & customer interaction with custom field options, list segmentation, auto-responders & triggers. Fraudulent mail, spam, spoofing and phishing are becoming more prevalent each and every day. The sub-domain authentication and protection methods safeguard your company and ensure your campaign emails get delivered every time. 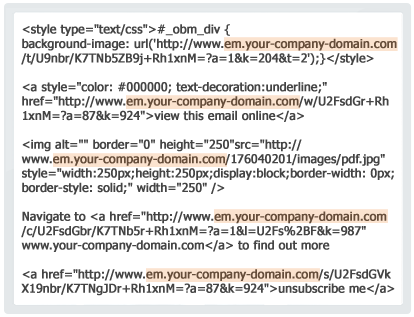 Only your Company’s sub domain is used! 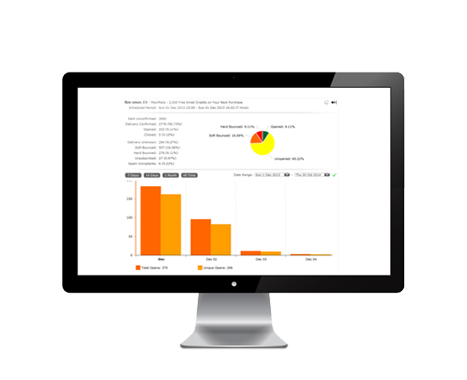 Receive daily or weekly reports to show full campaign statistics. PDF includes campaign statistics, confirmed delivery, timed opens (in seconds), clicked, unsubscribed, soft and hard bounced, printed and forwarded. Available with or without the subscriber data. Excel spreadsheet lists the status of every email address in seperate worksheets. Compare the latest campaign against a previous campaign’s statistics to see which was more successful. Knowing exactly how long your subscriber viewed the email is critical to determine the true success of a campaign’s content and subscriber interest. Cost effective email campaigns at you fingers tips! No setup fees. No hidden contracts. Cancel Anytime. An Enterprise-Grade Solution with Premium Features at Ridiculously Low Prices! ¹Dedicated IP address addon required. ²Unused email credits expire monthly. Upgrade the features in your account based on your needs. You can add these at any time. Upgrade your standard Auth SMTP settings. Upgrade your standard Email Credit package. Add additional extra services to your standard Managed Campaign services. ³An additional charge will apply if you require us to extract content from your existing website to build your email campaign. Please contact us for an accurate price. Upgrade your standard shared IP settings. Segregate your campaign emails from other companies by using a dedicated IP, this can significantly improve your email deliverability. Add additional one-off features to your account based on your needs. You can add these at any time. Add additional one-off Email Credit packages. These last for the life of your account or until they’re used up. Add additional one-off services to your Managed Campaign services. ¹An additional charge will apply if you require us to extract content from your existing website to build your email campaign. Please contact us for an accurate price. 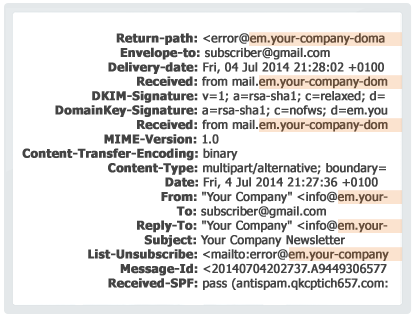 ²To ensure your mail is trusted you need to have clean lists to start with. Your contact lists will be screened through a Data Cleansing system, this removes bad and poorly performing email addresses which in turn increases IP and domain reputation, resulting in more mail being delivered and opened! Please contact us for an accurate price. Our payment provider PayPal also accepts Debit & Credit cards including Visa, MasterCard and Maestro cards. We also accept bank transfers. Currently we don’t accept any other payment methods. No, there are no extra charges for usage. The price you see here for your package is the price you pay. If you exceed your quota, optional extras/addons are available. You have the option to upgrade (or downgrade) from your base package at anytime, from within your account. Or you can always contact us. You’ll simply pay the difference or receive credit for your next payment. Do you offer a non-profit discount? Yes, to receive a 20% discount simply contact us with the registered details of your non-profit organisation. We’ll apply the discount code to your account, ready for your first payment. Email marketing is the perfect method to engage and develop good relationships with your audience. You can target your message to a specific type of customer, interact with your subscribers and substantially convert more business. This is more cost effective than any other type of marketing. Whether you’re just starting out or ready to take your email marketing to the next level, our pricing scheme makes things really simple. We offer an affordable managed email service with tailored support to match your exact requirements and budget. So save time and resources to maximise your campaign results with Lifeboat Marketing’s Managed Email Service. Outsourcing your email campaigns with Lifeboat Marketing makes your Email Marketing so simple! Copyright 2014 - 2019 © All Rights Reserved. Lifeboat Marketing™ and logo are trademarks of LBM Technologies Limited. LBM Technologies Limited is registered in England. Company No. 8997898. Data Protection No. ZA321437. Registered Address: 6C The Strand, Brixham, Devon, TQ5 8EH.